You should not needle your lips. It never crossed my mind that anyone would try that.. I will make sure our instructions include the warning that one should not needle the lips. The skin on the lips is extremely thin and you certainly should not stick a 2 mm needle into them.. The skin on the lips can more be compared to a mucous membrane - not suitable for needling. Or did you mean above the upper lip? The scars may still improve a little by themselves. Wait about 8 weeks from their formation. Yes, you can start applying the copper peptides now. I recommend a 1.5 mm dermastamp with 35 needles. Stamp densely every three weeks. If you buy a 1.5 mm stamp, you do not have to buy a 1 mm as well. Just do not insert the full length of the needles. Be always extremely gentle and careful on the nose and if the scars are not very bad, do not even risk treating them. Dermarolling / Microneedling / Re: Can I trust your Retin A cream? Where do you get it from? (enlarge it by clicking on it). We buy the tubes OTC from a pharmacy or multiple pharmacies in one of the very few European countries that allow that: Spain. Spanish pharmacies still only allow occasional small purchases for personal use, so we have a subcontractor in Spain that does nothing else but buying tubes and dropshipping them for us. So when you order this product, it is always shipped separately from your main order, and you'll find a Spanish postage stamp on the package. The tube comes with a list of ingredients enclosed by the manufacturer, but we also list them in our store. European pharmaceuticals are subjected to at least the same strict tests, licensing and manufacturing regulations than in the US. The regulations are extremely strict, so strict that they seem to be designed to allow only the largest multinational pharmaceutical corporations to supply the European market. Dermarolling / Microneedling / Re: How much Bruising with Suction Method? In our dermaneedling instructions we mention that it is a good idea to take vit. C orally as well, yes. Dermarolling / Microneedling / Re: Where can I buy a Suction cup/vacuum? This is individual and there is no other way to know how your skin reacts than trying it. Some get bruising and some do not. You must needle or stamp the area prior to suctioning (preferably a day before). The more aggressively you needle/stamp prior to suctioning, the more chance of bruising but even the suctioning itself can cause bruising (without needling and stamping). You must try it to know the effect. Do a small test area first. Dermarolling / Microneedling / Re: Can someone explain the Suction Method? About 50 of our customers already are using the suction method. You can do it yourself. We used to sell a totally different type of single needles, they were a kind of tattoo needles and their length was often too long so they caused bruising. Then we designed a much better single needle, more ergonomic and with an exact length that does not need adjusting. Those needles we sell now (sold out at the moment but we get new stock in a week or so). I think there is quite a big likelihood for your scars to improve. Stamp all your scars densely every three weeks (including the white spots that surround the scar on your chest) with a 1.5 mm dermastamp with 35 needles. Also, try different approaches, for example sometimes apply your A-Ret cream to the scars right after stamping. Concerning the redness, apply topical non-steroid anti- inflammatory OTC-substances such as Ibuprofen or Diclofenac gels. It may help. Or buy NUROFEN rapid capsules or NAPROXEN capsules and pierce them. They both contain a nonsteroidal anti-inflammatory subtance. 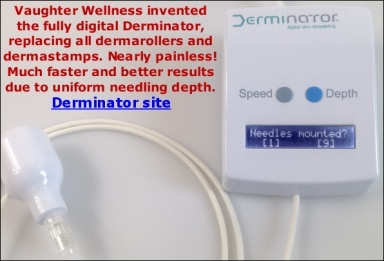 Yes, the single needle does penetrate into the deep layers but if you have many acne scars, buy a 1.5 mm dermastamp. Dermarolling / Microneedling / Re: Why does vitamin c have to be applied in the evening? You can apply vit. C in the morning if you prefer, it is not really crucially important whether you apply it in the morning or in the evening. For the reasons I gave, evening application is more optimal but it is not fundamentally important. I am aware that some people advise vit. C to be applied in the morning, but unless they have better arguments than my arguments, I would ignore that advice. Dermarolling / Microneedling / Re: Bromelain (meat tenderizer) and Glycerin Scrub? Since enzymatic meat tenderizers break down the peptide bonds between the amino acids in collagen, I do not think it is a good idea to use them. If you wanted to exfoliate, use fine table salt or ground coffee. From our experience, the best results for crêpey/sagging skin is the combination of a short-needled dermaroller (to speed up the turnover of the skin) and a long-needled dermaroller (to trigger the formation of new collagen and elastin). We recommend using a regular 0.5 mm dermaroller (roll up to three times a week) and a regular 1.5 mm dermaroller (roll very densely every three weeks). In addition to it, use a dermastamp on specific problems such as the individual wrinkles or lines. Using a 1.5 mm dermastamp for your grooves and lines is a better option than a one liner roller. Start using oils (such as almond oil) on your lost elasticity skin because they are excellent moisturizers. Wet a cotton pad, add some oil and apply it on your skin. If the corners of your lips are heading downwards which gives tired, perma-frown expression, it can be fixed by regular Botox injections. Unfortunately, dermarolling will not lift the corners of the mouth because it is dropping due to muscles.